I want to congratulate you for being among the first to volunteer for service in the Peace Corps. As you know, you are now eligible to take the Peace Corps Entrance Examination on May 27 or June 5. Nations in Latin America, Southeast Asia and Africa have already indicated their interest in having Peace Corps Volunteers serve with them.... I was gratified to learn of the many people who have applied to serve in the Peace Corps and of the wide range of skills you represent. I hope that those of you who are chosen will carry your mission to these lands in such a way as to demonstrate the desire of Americans from all walks of life to be of service. The success or failure of the Peace Corps may well be determined by how well our first Volunteers live up to these high ideals... I wish you the best of good fortune in your Peace Corps tests. Less than two weeks later, the results were in: of the 3,540 Americans tested, only twenty-seven were chosen to start training for a world-wide assault on poverty, illiteracy and disease. That was the beginning –fifteen volunteers to a farm and village project in Columbia, twelve for a road survey and building project in Tanganyika. A half century later, despite the rigors of selection and training, hundreds of thousands of Americans have signed up to serve in the Peace Corps - for two years, without pay - in 139 different countries. An enormously popular program, the Peace Corps has proven to be one of the enduring legacies of Kennedy’s presidency. This historic letter welcomes those first heroic volunteers – and shows how important this extraordinary project was to the new President. Typed Letter Signed, as President, 1 page, quarto, The White House, May 22, 1961. 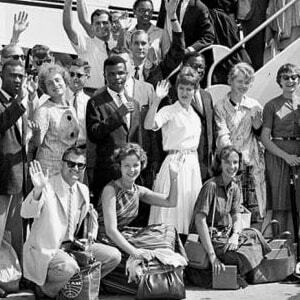 To the very first Peace Corps Volunteers. With a draft corrected in autograph; a copy of the letter; two unsigned carbon drafts; and a carbon memo dated May 17, 1962, from Deirdre Henderson, assistant to Mr. [Harris] Wofford, to Mr. Patterson.